Rotisserie chicken, browned and crisp and studded with spices. Editor’s note: Devra First has stepped down as restaurant critic. 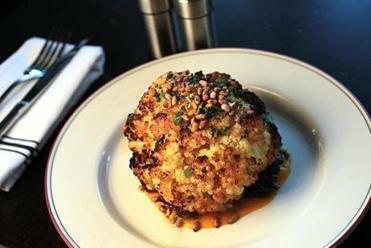 Dining Out will feature a rotation of guest reviewers until the Globe names a new critic. Starred reviews will return at that time. Order chicken in mixed company these days and you’re likely to earn an eye roll from the foodie at the far end of the table. Really. Somewhere along the way, the people’s bird became an afterthought on restaurant menus — the thing chefs tacked on in case grandma was coming to dinner with her far more fashionable kin. Sure, some places did it right: Hamersley’s Bistro prepared a beautiful bird, and devotees flocked for a final feast before chef Gordon Hamersley flew the coop last fall. Enter Garrett Harker, Boston’s restaurateur of the moment — Island Creek Oyster Bar, Row 34, Eastern Standard — seemingly hell-bent on redeeming the humble hen. At Branch Line, the uncommonly satisfying and straightforward Watertown eatery from Harker and partner Andrew Holden (a Watertown native), the chicken takes center stage: Here, famed Green Circle chickens — free-range hens fed a diet of vegetable scraps from restaurant kitchens and farmers’ markets — twirl in an oven engineered to the standards of a luxury car. Naturally, the chicken is outstanding. But like many things at Branch Line, enjoying it requires more than a little labor. Salted avocado with ricotta salata. Built into an old industrial space in the athenahealth complex in Watertown, the room manages to be cavernous and welcoming all at once. The high ceilings and tall windows add air to a crowded dining room. Demand is already outpacing availability after the October opening — the bar, on weeknights and weekends alike, is mobbed — and an enclosed outdoor area adds seats. The dining room mirrors the food: elegant but unfussy, impressive and unpretentious. At Branch Line’s center is that rotisserie — a gas oven the size of large wardrobe, its flames steadily licking at chickens turning on a spit. Every so often, someone in the open kitchen will hoist a wand full of chickens, browned and crisp and studded with spices, out of the oven and onto a nearby surface to rest. On the one hand, yes: This is real food cooked honestly. These are chickens who were not tortured to death, and they are prepared with care. But on the other hand, hasn’t Greater Boston inflicted enough spinning chickens on the undiscerning public? Founded in Newton and now based in Colorado, Boston Market has been rotating dubious yardbird for decades. And if they’re going to sit at the carving station for a bit, why not — you know — carve them? 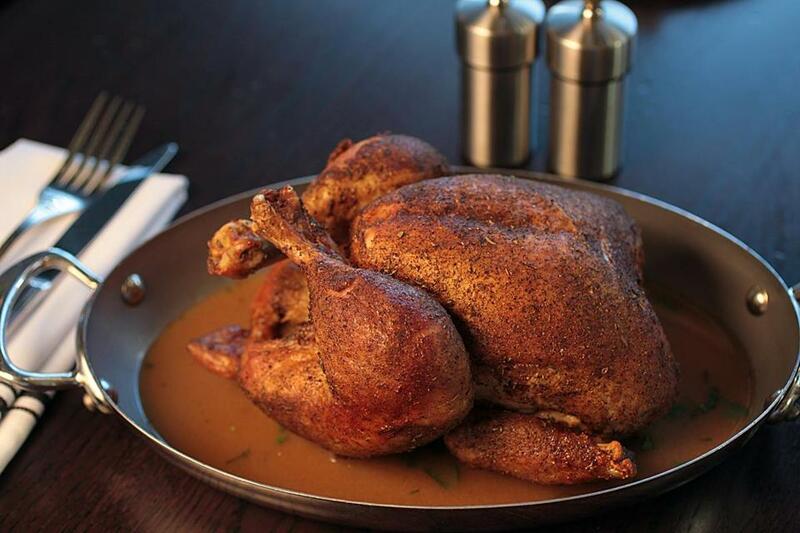 Ordered as a whole or half bird, the chicken arrives majestically alongside your a la carte options. But afforded only a steak knife the size of a ballpoint pen, the unlucky diner who happens to be sitting nearest the dish is left to hack at it while friends and family look on in horror. Before you know it you’re into the carcass up to your second knuckle, hunched over the table and hoping not to tip over a water glass. If you wanted to end the night slathered in grease and clutching a blade, you’d surely have stayed at work. Like almost everything at Branch Line, it’s worth the trouble. 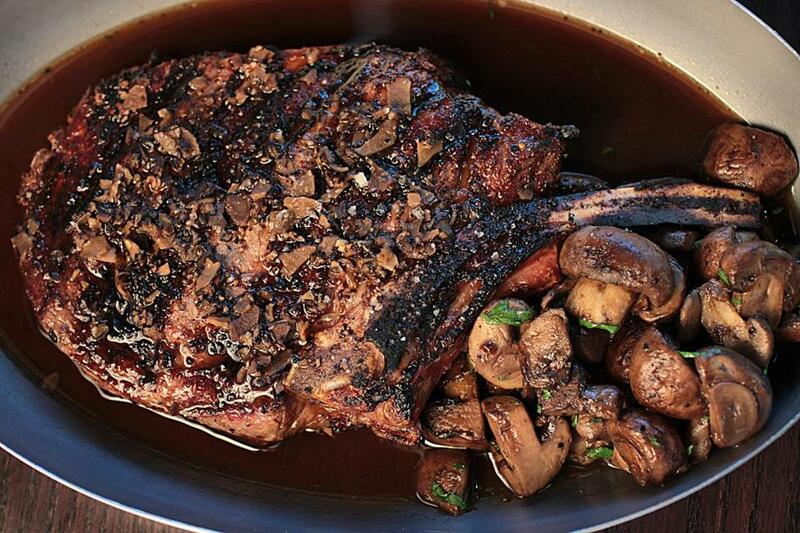 The flesh, white and dark, is moist and rich and carefully seasoned. The skin and sauce provide a savory punch that makes the urge to grab what’s left and tear at it with your hands hard to resist. But if Branch Line’s centerpiece is the chicken, the kitchen — helmed by chef Stephen Oxaal — soars higher than the bird alone. A salad of sugar snap peas sliced into matchsticks manages to be inventive, simple, and satisfying all at once, the crisp peas standing up to dense, granular paste of ricotta cheese and marcona almonds. You’ll spend all night wondering how you might turn snap peas into that shape at home. 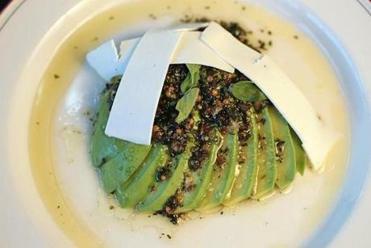 The salted avocado, one of several standouts on a small-plates section of the menu that is extensive enough to make a meal from, is deceptively simple: A perfectly ripe avocado half is sliced thin, drizzled with oil, paved with coarse marjoram, salt, and pepper, and draped with thin sheets of ricotta salata. Among the larger plates, a bone-in rib eye and a lean, fibrous bavette steak showcase each cut’s inherent pleasures. Intense, unctuous porchetta arrives dredged in a pungent sauce and buried in bright greens — the only things that could stand up to the crispy, fatty skin and the rich pork at the center. And cauliflower, nearly as omnipresent as chicken these days, somehow is rejuvenated by the rotisserie oven, caramelized and meaty and resting on beefy, thick-cut mushrooms. Whole branzino, a dish swimming quickly toward the same tired pool where lobster Thermidor and clams casino retired decades ago, is here redirected by a dense, chimichurri-esque paste and a bouquet of fresh herbs. But the fish is at least as demanding as the fowl. The branzino’s tiny bones mar most mouthfuls. A grilled prawn appetizer, composed of three giant, gorgeous whole prawns — heads and all — is worth photographing. But finding your way to their flesh requires either the precision of a sushi knife or hands smeared with oil and herbs. Rotisserie cauliflower served on mushrooms. Desserts are simple and mostly straightforward, particularly a sweet cream ice cream made to Branch Line’s recipe at nearby Coop’s MicroCreamery. Ribboned with salted caramel and blasted with crunchy hazelnuts, it’s a sundae to put to shame all the elegantly unsatisfying quenelles of gelato plaguing high-end dining rooms. Service is exceptional. The waitstaff is knowledgeable about the interesting, carefully curated beer and wine lists — both of which include enough quality and variety to make up for the absence of a cocktail program. A handful of local brews pour alongside an assortment of wild ales, gose beers, and other lesser-known styles. The wine list includes a rotisserie section — reasonably priced bottles that ought to pair well with the chicken — and a handful of harder-to-find bottles suitable for celebrating a promotion without blowing through the whole raise. Sides are a la carte and more than enough to share; fried potatoes and roasted carrots over a generous dollop of rich yogurt are standouts. Carefully timed service whisks away early plates before the smallish tables are overrun. The waitstaff is working very hard at Branch Line. So it seems almost unfair to ask this. But perhaps they could take a crack at carving the chicken? 321 Arsenal St., Watertown, 617-420-1900, www.branchlinearsenal.com. All major credit cards accepted. Wheelchair accessible. Prices Small plates $4-$6. Appetizers $10-$15. Entrees $18-$39. Desserts $7-$8. Hours Dinner Mon-Thu 4:30-10 p.m., Fri-Sat 4:30-11 p.m. Bar Mon-Thu 11:30 a.m.-11 p.m., Fri-Sat 11:30 a.m.-midnight. Lunch Mon-Fri 11:30 a.m.-2:30 p.m. Noise level Reasonable, even amid the bustle. What to order Salted avocado, sugar snap pea salad, rotisserie cauliflower, rotisserie chicken, bone-in rib eye, sweet cream ice cream with salted caramel and hazelnuts.